In order to celebrate May 1 International Labor Day and the 23rd establishment anniversary of China Transport Group, look back at the past, Forward look into the future, enhance the cohesion of the enterprise and show the comprehensive strength of China Transport Group. On the morning of April 28, China Transport people gathered together to hold a grand conference for celebrating May 1 International Labor Day and the 23rd establishment anniversary of China Transport Group. 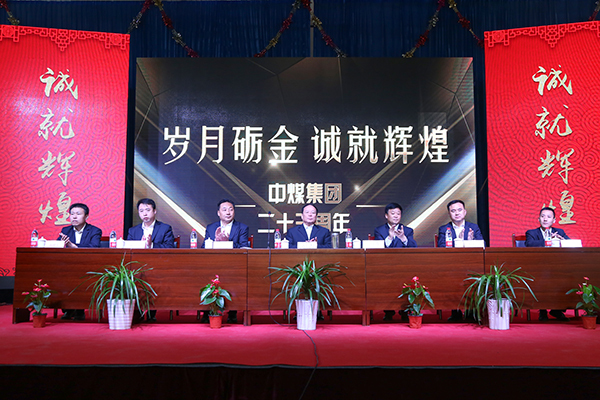 Chairman also General of China Transport Group Qu Qing, Executive Deputy General Manager Han Yong, Feng Zhenying, Li Zhenbo, Deputy General Manager Fan Peigong, Sun Shijun, Guan Chenghui and other group leaders attended the conference and seated on the rostrum. All the cadres and staffs of the group participated in the conference. 8:30 am all staffs lined up, firstly held a solemn flag raising ceremony. Accompanied by the music of sacred national anthem "March of the Volunteers"in the air, the national flag of the People's Republic of China and the group flag of China Transport rose slowly, added a pinch of sacred color to the sunny sky. All staffs wearing a trim working suits, neatly lined up, held a watching salute to our national flag for honoring our bright five-star red flag and the group flag! The determined look tells the unlimited loyalty and passion of China Transport people to the group future! After the flag-raising ceremony was completed, under the leadership of the Group's Deputy General Manager Feng Zhenying, all staffs read the oath of China Transport Group, a sonorous and powerful vow resounded through the sky, fully demonstrated our ambition and passion for our career, expressed the confidence and determination of the whole staffs to being loyal to, dedicate to China Transport Group. 9:30 am, Group leaders and all staffs and workers seated in China Transport Group assembly hall, the host Li Fan solemnly announced the official beginning of the conference for celebrating May 1 International Labor Day and the 23rd establishment anniversary of China Transport Group. General Feng, through personal experience, led us to carefully review the development process of the Group from the difficulties in doing business in the just establishing time of 1994 to today's development and grandness that achieved gradually, G. Feng said, the 23 years' unremitting endeavour is the only way to cast our brilliant today. From a firm operated in a rented office to owning a modern industrial park, a development base today, all the achievements is depend on the continuing efforts of our our past and nowday's elites. As one of China Transport, we should be proud and Pride; As one of China Transport, we should work harder, with actual action to create better performance for rewarding the Group! General Han firstly on behalf of the group leadership team extend holiday greetings to the staff who is struggling in every position of the company for many years and their family members, express a sincere thanks to the leaders in all level, also the domestic and abroad customers who concern and support the development of China Transport Group. G. Han said, over the 23 years, China Transport people tackled and solved many difficulties, being pioneering and innovative, not only made a qualitative leap in the production and operation but also built our own home. Guided by the Group's farseeing leadership team, we have achieved remarkable development in various fields such as e-commerce, cross-border e-commerce, information technology, software development, agricultural high-tech, intelligent equipment, big data, cloud computing and won a number of national and provincial honorary title, gained a high degree of recognition from the national, provincial and municipal leaders in all levels. All the honor are relied on the joint effort of all staff. G. Han said that the new park, a new starting point, new hope, in the next I hope that all cadres and employees have firm confidence, and resolutely implement the group "544321" great strategic objectives, in order to make a positive contribution to the goal of "produce 100 Millionaires, Gather tens of millions, build ten billions China Transport" ! 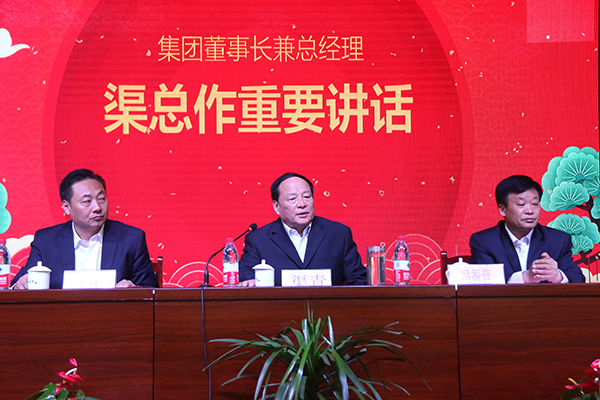 General Li Zhenbo led us to review the development process of China Transport Group e-commerce, G. Li said that China Transport Group from a small business that only hire a few dozen employees, through 23 years' development, grown to a large-scale modern enterprise that have more that 600 employees right now. Our products from a single industrial and mining machinery to a wide range of intelligent equipment, office from the rental bungalows to now have our own office buildings and intelligent equipment workshop, these achievements can not be separated from contribution of every new and old employee. He also said that all staff must take this good opportunity to make good use of all the hardware facility of the new park, more hard work, continue to carry forward the China Transport spirit of always hard struggle and being pioneering and innovative, grasp the historical opportunities, set sail again for new voyage, do our best to make China Transport Group take off again and achieve a new leap in development of the group! Next, the group manufacturing plant director Xie Ticai, finance section deputy chief Yang Qingqing, Communist Youth League secretary Guan Chenghui, women's association director Yan Ting, old staff representative Shi Juan, new staff representative Xie Chunlei, party representatives Lu Shuli, outstanding contribution award Xu Yuanyuan and other cadres and employees representatives delivered their speeches in turn, warm speech won bursts of applause from the audience. In order to set up models, honor excellence, motivate more staff to work hard and make greater contributions to the future development of China Transport Group, the conference grandly commended 20 employees in recognition of their outstanding contributions to the group development. lively held a "Outstanding Contribution Award " ceremony, the group leaders handed out the honor certificates and prizes to them and gave a congratulation. Finally, General Qu made an important speech. On behalf of the Group, General Qu congratulated to the outstanding employees that wee recognized by the Group and expressed his sincere gratitude and respect to the cadres and staffs for their hard work and outstanding contributions to the development of China Transport Group! G. Qu said that since the founding of the group 23 years ago, we have gone through three development stages: 1994-2008 is the first stage of hard working, we do not have our own office, no fixed clients source, still our staffs made our firm growing on the virtue of hard-working and pragmatic spirit; 2008 -2013 is our transition stage of development, in 2008 we established China Transport e-commerce sales team, start the transition from a traditional industrial and mining enterprises to modern information enterprise. Just a few years, through the unremitting efforts of all staffs, the group has achieved comprehensive transformation and rapid development; the third stage is from 2013 to today, the group won a miraculous rise in recent years. From our successful auction of the 60 acres land in November 2013, to today all the staff sitting in a bright and spacious office. Also about three years, we built a more than 10 thousand square meters modern intelligent equipment production workshop, successfully completed the transformation and construction of 11 layers and nearly twenty thousand square meters e-commerce building and its two side buildings, we completed the machinery factory relocation, achieved a nearly 600 e-commerce business team employees' overall relocation, under the Group leaders' wise guidance, all staffs are producing, managing and building at the same time. All staff are brave, enterprising, pioneering and innovative. In the rapid development times, they bear a lot of tests, persist to work hardly, finally grown into a leader in mining industry, become a front-runner in e-commerce business. G. Qu said the achievement that we won today are rely on the virtue of being pragmatic and honest enterprise spirit, I hope all the staff to carry on, I believe, under the farseeing leadership of the group, and joint efforts of all the staff, The future of China Transport Group will be more brilliant! The speech from General Qu is simple and clear also sonorous and powerful. all staff was highly encouraged, their applause was explosive. Most of them expressed the willing of being loyal to, dedicate to China Transport Group. They would work more hardly and create more benefit in high enthusiasm for making the maximum contribution to one hundred years development plan and splendid tomorrow of China Transport Group. Accompanied by the majestic national anthem, the conference ended--the celebrating of International Labor Day and the 23rd Anniversary of China Transport Group Establishment acquired a complete success!